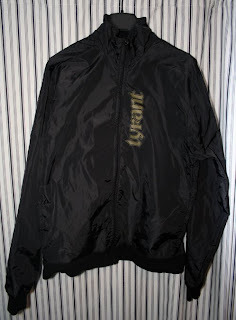 I received a few e-mails from guys I met at Highland this weekend about buying TYRANT merch. The "Store" link from the site goes to an off site vendor that prints shirts for me. The quality is great, the turnaround is quick, and there is a wide variety of clothing styles....but there are only a few designs available there. I am still screening most of the clothing in house! For now, if you want any of the items that have been featured on the blog (jackets, hoodies, shirts, etc.) contact me directly and we can talk: rideTYRANT@yahoo.com I am trying to find the most effective way to set up a shopping cart on the new site, not sure if I want to use Payl, CartFly, etc. Thanks for the support folks!